Visitors to the Unity booth at the Game Developers Conference in San Francisco will get a special augmented reality treat courtesy of Magic Leap and Weta Workshop. On Monday, after alluding to the reveal in a blog post last week, Magic Leap revealed Grordbattle, a multiplayer extension of Dr. Grordbort's Invaders that turns one to four players into characters from the game and pits them against each other in virtual warfare. The Unity booth will be the exclusive site of first looks at the multiplayer experience. "Even at the tail end of developing the game, we started to realize that we really wanted to explore multiplayer and have people share their experiences," said Weta Workshop's Greg Broadmore, game director for Dr. Grordbort, during an interview at the Unity keynote pre-show. "Because, on the Magic Leap One, you're still in the real world, you can still see everything around you, but you're having this unique experience, and no one else could see it. So we wanted to solve that problem immediately"
The new game mode is an early prototype of what a multiplayer experience for Dr. Grordbort's Invaders might eventually look like. 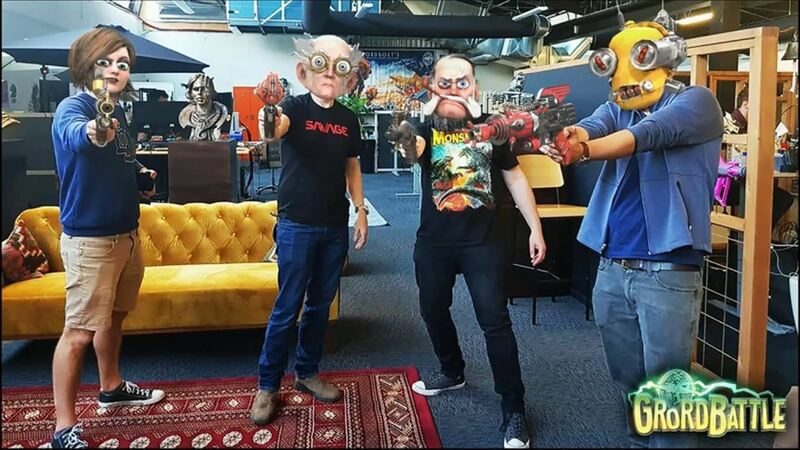 In Grordbattle, players can choose between one of the four main characters of Dr. Grordbort's Invaders to wear as a virtual mask within the AR experience. 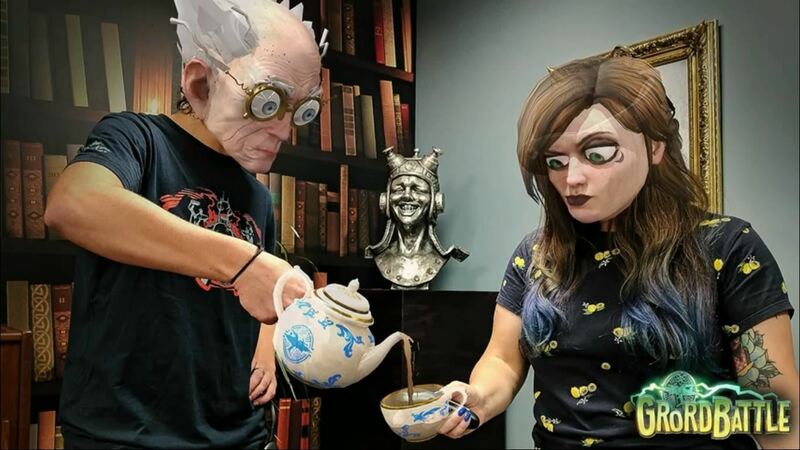 Each avatar mirrors the player's eye movements via Magic Leap's eye tracking technology and mouth movements based on voice recognition. "It's quite a surreal, transformative experience, and so we're really excited to show people because I think it sort of signposts something really exciting for the future of spatial computing," said Broadmore. A demo of the prototype will be available exclusively at the Unity booth #S227 Wednesday through Friday between 10 a.m. and 1 p.m. Pacific time at GDC. Outside of those times, attendees will still be able to play Dr. Grordbort's Invaders. In addition to the prototype demo, Thomas Hall, a senior programmer for Weta Workshop, will reveal some insights into developing the multiplayer mode in a "lightning talk" on Tuesday (at a time yet to be revealed). Multi-user experiences are a quickly evolving capability for the Magic Leap One. Last week, a company founded by current Magic Leap employees launched Spatiate, a painting app that connects multiple local and remote participants in the same collaborative AR space. And previously, Magic Leap released Avatar Chat, the company's AR video calling application, which now supports three-way calling. However, Weta Workshop stands as the first developer to take a stab at multiplayer gaming for the device. Having already garnered an award nomination for technical achievement in immersive gaming (losing out to another Magic Leap One app, Tónandi), Weta has suddenly raised the bar even higher for the future of AR gaming via Magic Leap.